Carpal Tunnel Syndrome is a painful condition that happens when the median nerve in your wrist is compressed by swelling, often due to an underlying medical condition. It is one of the most common conditions affecting the nerves. Traditionally there were few options to deal with this problem and those available, such as surgery and medication, were invasive and expensive. Fortunately, chiropractors in Dickinson have success treating Carpal Tunnel Syndrome with a more conservative and gentle approach. 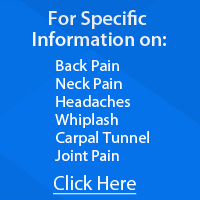 If you are wondering whether your wrist pain is caused by Carpal Tunnel Syndrome, and want more details on the alternative treatments available from Dickinson chiropractors, then read on. Fortunately, many people in Dickinson are finding long-term relief from Carpal Tunnel Syndrome through chiropractic treatment. Chiropractic medicine is a non-invasive alternative that seeks out and deals with the underlying cause of Carpal Tunnel Syndrome. A chiropractor will perform an evaluation of your condition and formulate an individualized treatment plan that will work to correct nerve interference in the spine and restore you to an optimal state of health. If you are noticing any signs of Carpal Tunnel Syndrome do not hesitate to call our team at Neck & Back Pain Treatment Center today for a consultation.